Here’s the funny thing about “Holy Grail” records. Most of the time, you don’t even know they exist until you find one! Blue Rodeo is one of those bands for whom I collect “everything”. Their box set filled a lot of gaps, but I am still missing a few things. To the Discogs! I was searching for one of the Blue Rodeo Live in Stratford albums. There are two; I only have one, and it’s excellent. While searching for that live album, I found this promo EP instead, at a good price and in great condition. Upon reading the tracklist, it contained four Blue Rodeo tracks I didn’t have and didn’t know existed! 1989’s Diamond Mine is still considered one of the band’s greatest albums today, if not #1. The “God and Country” demo that leads off Diamonds in the Rough is an acoustic rendering of one of its best songs. “How Long” is a fully arranged demo, sounding live off the floor. Since this record was cut for radio stations to play, it’s quite possible that you heard these versions at some point in early 1989. I hadn’t, and neither is included in the box set. Of course they don’t have the production value of the full album, but that’s part of the appeal of collecting rarities like this. Side two has the single edit of their big hit “Diamond Mine”. The album cut is 8:18, full of psychedelic organ solos and Doors-like jamming. A shorter single edit of this song is always handy, and you can’t get it on their Greatest Hits CD. It’s similar if not identical to the music video version. As if all of the above wasn’t enough to make this promo a worthy “Holy Grail” item, there are two unreleased demos for songs that never made it onto the Diamond Mine album! “Galveston” is a cover of the Jimmy Webb song made famous by Glen Campbell. Blue Rodeo’s version is manically fast, with Jim Cuddy’s sweet voice maintaining what made the song special. Finally it’s “Jig”, an acoustic instrumental with Bobby Wiseman on concertina. This is little more than an idea of a song rather than something fully written. 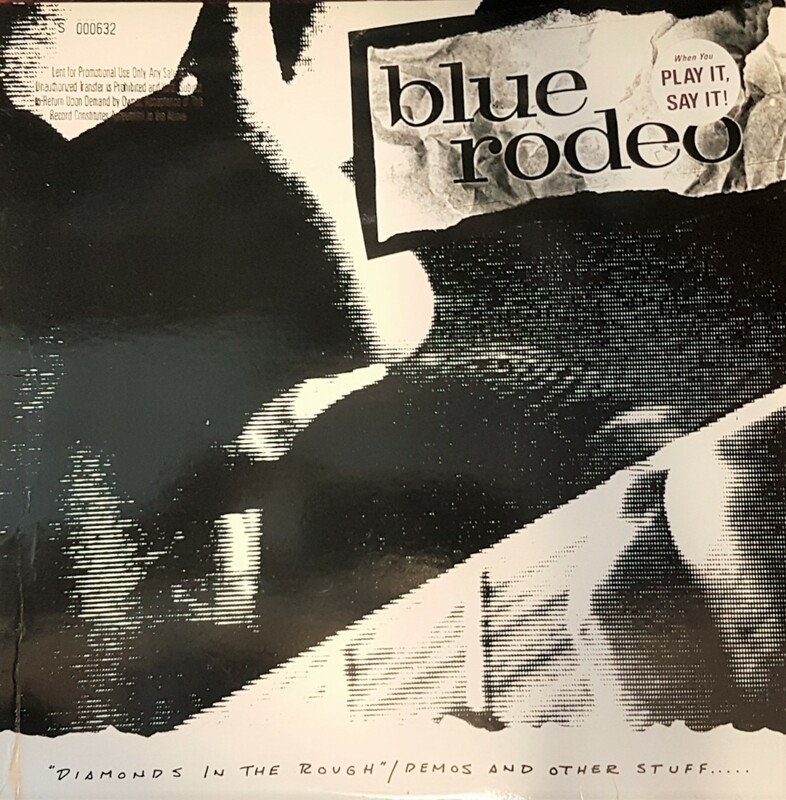 Regardless, these two unreleased goodies go to prove what a band of musicians Blue Rodeo is, particularly Wiseman and bassist Bazil Donovan, possibly the country’s greatest bass player on this side of Geddy Lee. If this record only had “Galveston” as its sole rarity, it would be still be a Holy Grail item. As it turns out, none of these tracks can be found on a Blue Rodeo CD today, so it really justifies its own purchase! Sweet. I love Holy Grail items. Nothing better than finding something you didn’t know existed. Especially if you are going through a record store and find it. The best feeling. My friend Len came by yesterday to take some old KISS magazines. In return he dropped off three records. I’m excited about all three and can’t wait to show you. One WAS a holy grail up until 7 months ago! That is awesome. Can’t wait to see what you got!! I’ll be making a post about them. They’re kind of special! Man, I do really dig finding something I didn’t know existed. This is a good find made better by the fact it includes tracks you can’t get on anything else. Exciting find! Want to know what records you got too! Fear not! I am preparing a post! They shall be revealed and I think you’ll be surprised. Average records, these are not. Maybe it’s me but I detect a little Bob Dylan influence in that song. That has me intrigued.